The Barbarian invasion die roll is an 8 -- so no incursions across the Empire's borders this turn. Each faction again has TWO action points -- I await your orders! RED and BLUE faction orders are in -- just waiting for confirmation on the GREEN faction's orders. I opine Green Faction orders will be "Effugete!" . . . There is but one true Caesar. Ave Wellsonius! Orders and moves have been processed and the fighting spreads to new territories. 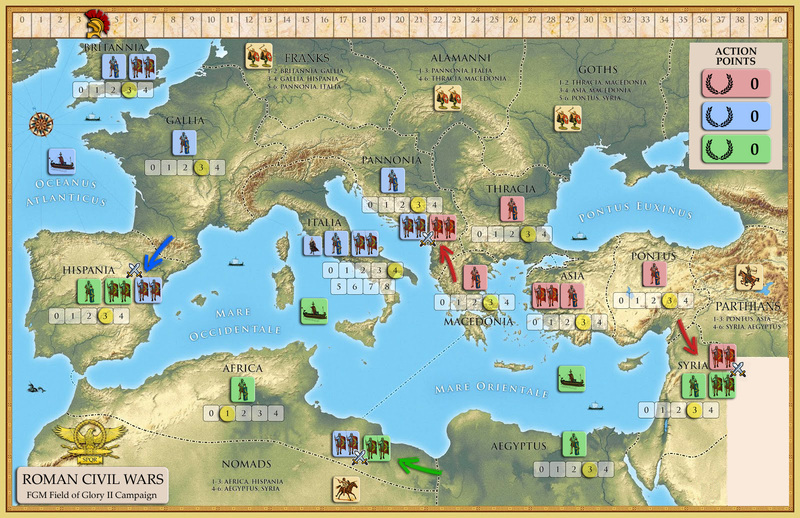 BLUE FACTION: Builds one new Legion in BRITANNIA and attack HISPANIA from GALLIA. RED FACTION: Attack PANNONIA from MACEDONIA and attack SYRIA from PONTUS. Please assign your battle commanders! These are the Blue assignments. The Hispania battle will be handled by Badgerius Germanicus. The Africa battle will be handled by Maddius. The third battle of Pannonia will be mine, Wellsonius. @Rico - please advise who should set up each battle and what parameters to chose. If you have the Red commanders, maybe we can start on my battle? I can set it up if I know who to invite. Soooooo....hello guys! Any chance you need a player? I've been wanting to get into FOG. Have the game but have not so much as slung a stone yet. Would be happy to join in if need anyone....or at least feel free to put me on a replacements list. I'm fighting in Syria. I think..
GREEN faction is in need of another battle commander -- so welcome aboard @Jolly Olly -- you will be thrown in the deep end of the circus and be defending SYRIA province from the RED invasion. Okay, map updated with all the battle commanders dropped in -- welcome @Jolly Olly to the battle field as a new army commander for the GREEN faction! ATTACKING players set up battle challenge. I suggest AFRICA and SYRIA battles play with either DESERT or MIDDLE EAST AGRICULTURAL maps. Ha ha! Oh boy.... what the "h" "e" " double hockey sticks" have I gotten myself into?!?!?! Thanks for having me gentleman! I am really looking forward to to giving this game a try. Please bear with me as I get up to speed here as to what I need to do. Will work on that after work today as best I can. Quick question....I vaguely recall seeing somewhere that I might have to set up an account with slitherine or something like that to exchange game turns. Is that correct or am I imagining that? I've clearly got a lot to learn quickly! This should be interesting....and fun! 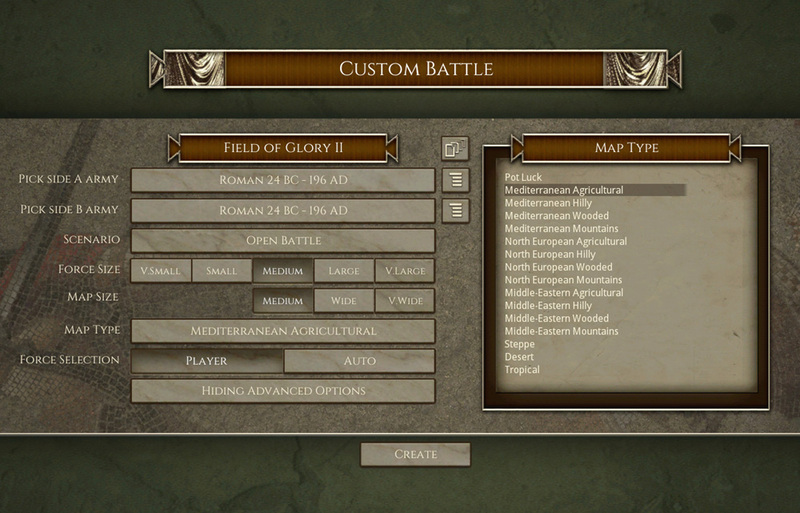 Yes, you need to set up a Slitherine account -- but that's easy as pie. Ok guys....help me out here. On the plus side...I already had a Matrix account...so now that they and Slitherine essentially operate a combined site it would seem I am good to go from that standpoint. On the downside....I purchased my games and current DLCs via Steam so it appears I can't technically register my games with Slitherine. 1)Does all that sound about right to you guys and does the fact that I purchased through steam matter? 2)Trusting I am still good to go...and will simply be using the Slitherine site to manage the transfer of game files.....where in the world do I go on Slitherine to get started/find my opponents challenge/get file, etc? 3)I'm curious....anyone have thoughts as to purchasing direct or through Steam in general? I bought mine through Steam and didn't have any difficulties......that was about four months ago. It does not matter one bit whether you purchase directly from Matrix, Slitherine etc. or Steam. As long as you purchased the game then you have access to the PBEM servers. What ever user name and password you use to get into the Matrix/Slitherine forums is the user name and password you use in game (Field of Glory II) to gain access to the multiplayer PBEM servers. It is easy peasy. I bought Gribys War in the East through steam and can still play other players.